To me, the best jump rope to burn belly fat is the Everlast Leather Jump Rope. The benefits of jumping rope are huge. A quality fitness jump rope is a smart addition to home workouts. 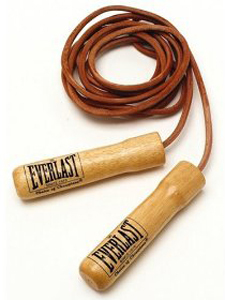 The Everlast Leather Jump Rope has been a staple of fitness programs for many decades. * The rope is made of genuine leather. * The handles are polished and contoured. * Movement is fluid and easy. * The handles and rope are weighted. * Spins fast for more intense workouts. * Easy to store. ALWAYS hang it. * Extremely portable. Great for travel. * Jumping rope is a low-impact activity. * Burn 250-500 calories in 30 minutes. * Easily learn new step patterns. * Extra speed is gained through precision steel ball-bearings.